You are currently browsing the tag archive for the ‘York PA Bakeries’ tag. 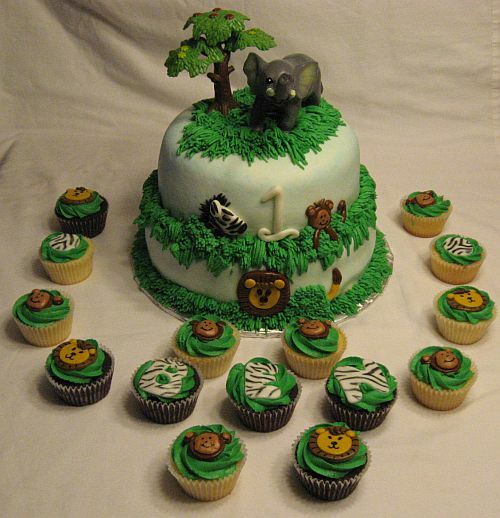 1st Birthday Jungle Cake and Cupcakes! We made a Jungle themed Birthday Cake for a 1st Birthday Party today. The two tier birthday cake was chocolate and yellow cake with buttercream icing. The cupcakes were a mixture of yellow and chocolate cake with Buttercream icing as well. The grass detailing going around the cake was made with Buttercream icing using a special tip. I think it looks very Jungle like with all the different lengths. The animals hiding behind bushes is the look we were going for with each tier. We wanted to create the feel of all the animals sort of peeking out of the bushes like a curious one year old would do! The zebra print on the cupcakes with the letters B E N was a last minute detail we thought of. His mother pretty much left the whole design up to us and we hope we hit her vision dead on! York PA Bakery On Facebook! Check out our Facebook Page and Become a fan today, we only post specials on Facebook! See what the special is for this month! Bear Heart Baking Company is located in York, PA! Dover, PA actually but we service York, PA and Surrounding areas! Our Bakery started in March of 2009 as a Gift Service, shipping treats across the United States. We made our first birthday cake in September 2009 for a relative in York, PA and ever since then it has taken off and we are making on average 5 cakes per weekend. We will be cutting back to 3 cakes per weekend because it is alot for our little Bakery to handle. Our Bakery also offers Cake Delivery for York, PA and surrounding areas! If you live in York, PA or surrounding areas feel free to Contact Us today to reserve your date! We fill up quick so Contact Us Soon!! Custom Roulette Wheel Fondant Birthday Cake! Bear Heart Baking Company recently made a Custom Roulette Wheel Cake for a Las Vegas themed Birthday Party. 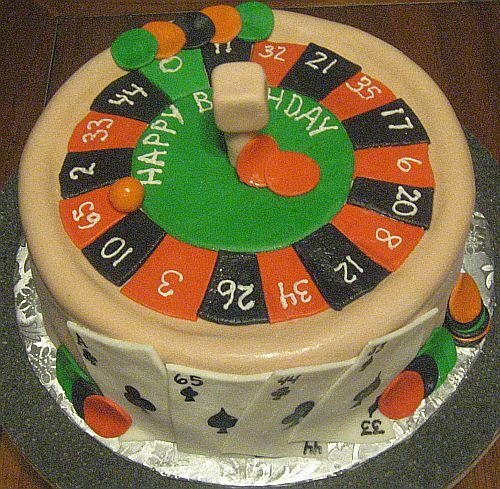 The roulette wheel and all decorations are made entirely of Marshmallow Fondant! 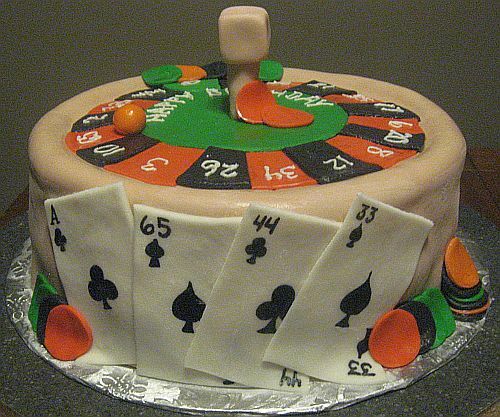 There are Las Vegas Poker chips stacked all around this cake. The playing cards reflect the ages of the three birthdays this cake was made to celebrate! It was a White Cake with an Orange Pineapple Filling and Italian Buttercream Icing covered with Marshmallow Fondant! I was told this cake tasted as good as it looked! If you are in York, PA or the Surrounding areas and would like a Custom fondant Birthday Cake or Special Occasion Cake feel free to Contact Us today for a quote!